for an incomparable journey into another world. You only have one life. It's up to each person to bring it into harmony with their own most deeply held values. Everyone wants more time to do what they really care about. But somehow we kept getting pulled away, or end up working too much, or looking to commerce to solve our deepest needs. Can we create an abundance from within ourselves, and from our connections to community instead of trying to purchase “abundance" with money? are three time-tested ways to make lasting change. 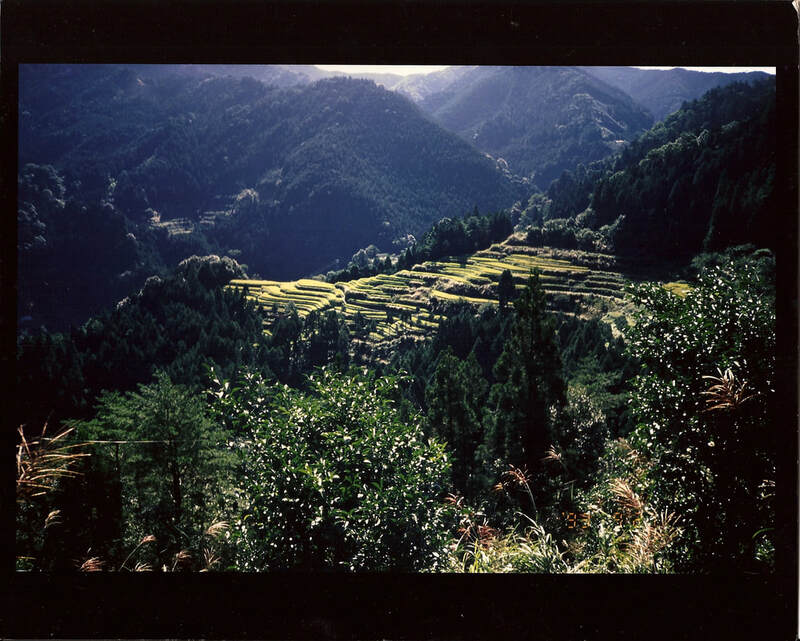 For the first time in twelve years, In May of 2019, professional writing teacher, author of The Abundance of Less, and winner of the 2017 Nautilus Award in Sustainable Living, Andy Couturier, will be leading a small group of travelers to the mountains of Japan--the beautiful village of Kamikatsu on the southern island of Shikoku. Using writing as a tool for self reflection (“non-writers” welcome), we can understand the forces--internal and external--that pull us way from the truly satisfied life we know we can live. The journey will combine time for writing and reflection with encounters with some inspiring Japanese people who are pioneering a new way of living. They have rejected the commercialism and status-consciousness of mainstream Japanese society and live lives of deep contact with the natural world. 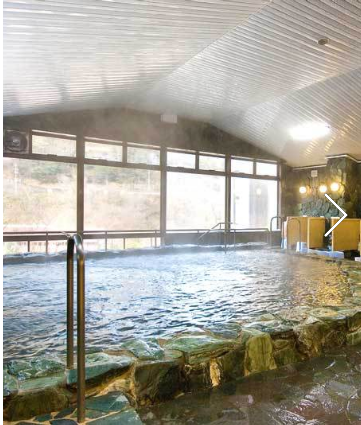 There will be time for slow walks in the mountains, visits to Buddhist temples, Shinto shrines, and daily baths in a rural hot springs by a rushing river. And every day we will go deeper into ourselves and into our experience by using writing to help us discover "The Good Life" for ourselves. the food delicious, the lifeway simple. 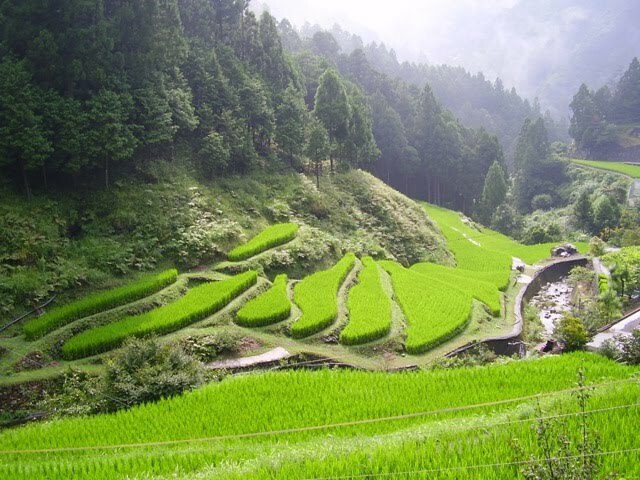 Instead of “the cornucopia approach” that many tours to Japan take, this journey will be slow, rich, centered in order to support personal reflection, connection with nature, and community building among group members and villagers. Instead of zooming all over the country, we will stay in one beautiful village for ten days so we can deepen into our internal reflection, and have plenty of time to write. We will stay at hot spring with an inn beside a rushing river for most of the ten days, with an overnight trip to the sacred Shinto Todoroki waterfall complex (over eight huge waterfalls) with an overnight by the ocean and a visit to temple on the Buddhist pilgrimage. Lodging will be modest but comfortable, in line with the theme of simplicity and respect for the natural world. Meals will be primarily vegetarian and incredibly delicious. This is a journey for people who have read The Abundance of Less and who want to go deeper. By meeting people profiled in the book, Atsuko Watanabe, (chapter 3) and Osamu Nakamura, (chapter 2), and by guided writing experiences, you will find the tools to bring your life more in line with your values--individual, environmental and social. The writing experience may be as rich as the visit to this extraordinary place. Together we will explore the subliminal barriers we all face in this very human struggle to work out the modern predicament. Using gentle and energizing techniques to access the subconscious mind, you will learn to access your own wisdom and figure out how to make meaningful changes when you go home. Building on what you are already doing to nurture and support a more connected and rich life, you will have an opportunity to examine how your life has gotten to the point it has. By the end of your journey you will have developed some inner tools and outer strategies to make real change, and you will have a vivid record of your experience. You will then be able to share this with your community to help inspire them as well. General daily schedule: On our retreat, we will spend part of each the morning or afternoon doing exploratory writing in a supportive and empowering environment (see below). Every day will have open time for you to walk, to contemplate, and to discuss what you are uncovering with others. We will visit Atsuko and Nakamura as well as many others who have moved to this beautiful village to re-orient their own lives. Not only will we have time for group sharing of our writing, there will also be time for private consultations with the instructor about your process, and to get help with this project of reorienting your life when you return. What are you already doing that supports & nurtures “The Good Life”? What concrete ways could you do it more? What are the forces (both internal and external) that pull you away from it? How could you create abundance for yourself and your community without using money? From here we dive into a lively and playful exploration, using Writing from the Subconscious techniques from Andy's first book Writing Open the Mind to discover new pathways, both philosophical and practical, that will truly support you living a deeper, richer, more fulfilled life when you return home. We will have a professional translator, and we have time built in for rich, slow conversations. There will be time to visit the local hotsprings, walk to temples and shrines and waterfalls, to hike in the forest, and take dips in the river. The village of Kamikatsu has been going through a beautiful rural revival the past few years, and has a new organic restaurant, a micro-brewery made from recycled windows, a rustic thatched-roof eatery, and the internationally famous "Zero Waste" recycling and waste recovery facility started by Atsuko. 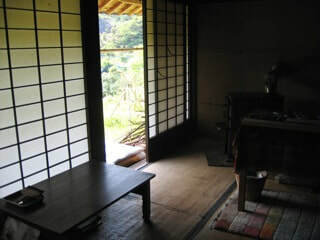 Simple, beautiful lodgings at Kamikatsu's hot spring resort. 1. You have read The Abundance of Less, in full. It does not make sense to fly across the world without taking the time to be familiar with what these people have said and have to offer. This is a journey that will deepen your experience of the book, so it's not just an entertaining read, but a gateway that can help you actually implement a new way of living. 3. You are able to walk in the mountains for 30 minutes or so. Given the difficulties of petroleum consumption on the planet, and the fact that rural areas are spread out, walking will be an important part of this journey. Group Members. Since the group will be traveling together for 10 days, and meeting our friends in their homes (and not on stage as performers demonstrating something for us) the tour leader will need to understand your approach to other cultures and cooperating with other people in a group. The tour leader reserves the right to choose the group members. Sharing: It is deeply hoped that you will be moved to bring your gifts -- perhaps an expertise, perhaps your storytelling, perhaps your own wisdom -- to the good people of this village too. There will be opportunities to share in this way. COST: The total cost of the ten day journey will be $3,250. It is inclusive of all in-country transportation, meals, lodging, hot spring admissions, guide services, cultural interpretation, translation, pre-trip orientation and writing guidance. (For comparison purposes, similar trips, which are oriented more around “sight seeing” range from $4500-$6,900). International airfare is not included. How to join. If you are interested in this unique journey, please contact Andy Couturier, using the button below as soon as possible to arrange a slow conversation by phone or skype. Once you have received your invitation from Andy, you will need to make a non-refundable deposit of $1500 by March 15. The balance is due by April 17. There are only twelve spaces available.